Tickets Houhora Wharf Store, Waitiki Landing, Hunting & Fishing Kaitaia, Laurenson Marine Kaitaia. Fish from land or boat. 1st, 2nd & 3rd for snapper, kahawai, trevally & kingfish; 1st prize for heaviest crayfish. $1000 cash prize for average weight fish sponsored byBJ’s Shelterbelt Trimmer. 1st, 2nd & 3rd for snapper, kahawai, trevally & kingfish & sprat lucky Draw. $100 cash prize for average weight fish sponsored by St Mary’s Church Houhora. Free fire engine rides for the kids; loads of lucky draws; raffles. 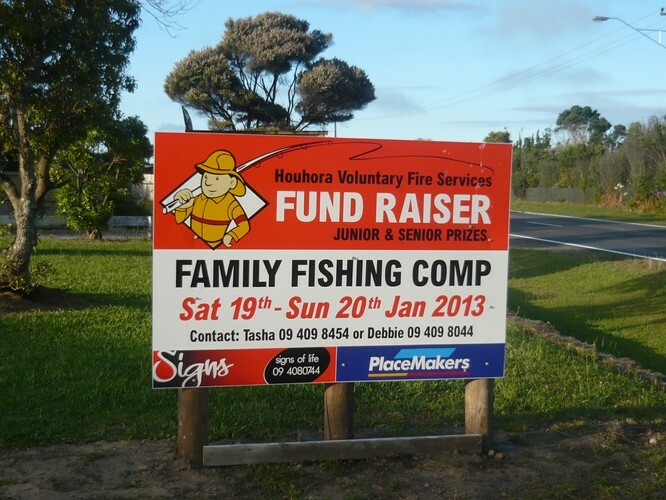 Prizegiving 7:30pm at the Houhora Big Game & Sports Fishing Club (Inc) - meals available. Full list of rules and our sponsors can be found on our Facebook page. Contact Debbie on 09 409 8044 or Tasha on 09 409 8454.